Martha Stewart says you should deep clean your home at least once a year. You know, air out the cabinets and dust the credenza? 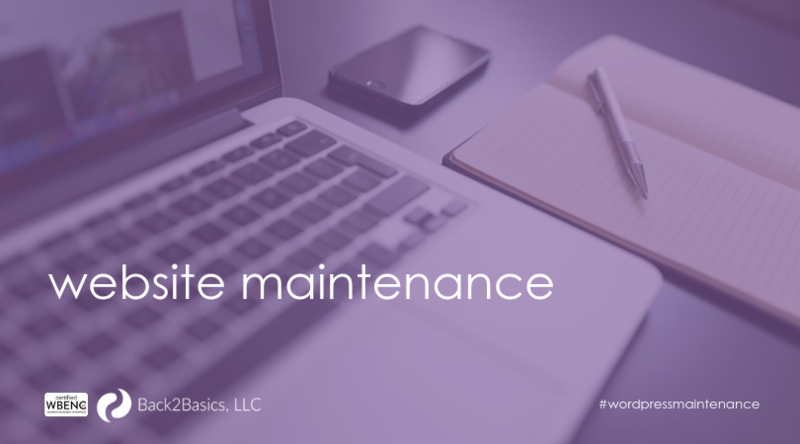 But did you know that your WordPress site needs yearly maintenance as well? In fact, your WordPress blog or website needs attention year-round. But for now, let’s take a look at yearly site maintenance that can keep your site running perfectly. WordPress sites are like cars… Stay with me here… If you don’t maintain a vehicle with regular oil changes, tire rotations, and fluid checks, eventually it will break down and be much more costly to repair. Your WordPress site is similar. Many bloggers and website owners don’t check in with their website and only perform maintenance when something breaks. After all, you’re busy optimizing your content, reaching the people! The problem with this strategy, of course, is eventually your site will crash or have a problem that requires taking it offline while you fix it. Every minute the site is down you’re missing out on valuable traffic. Doing a few minutes of maintenance periodically helps keep your site running how it should, and prevents unnecessary problems. Let’s take a look. This should be common practice before you make any changes to your site, but it’s worth mentioning here. Backing up your WordPress site periodically means, if it does go down, you have a recent copy and don’t have to start from scratch. Think about all the work that went into building your site. Remember the hours lost fretting over fonts and hex colors? Do you really want to do all that again if something goes wrong? You can even automate this to happen daily with a plugin like BackUpBuddy. Hackers are getting better and better, so try to stay one step ahead here. Use this maintenance time to change all your passwords. Make sure to create a strong password, and if you must write it down to remember it, keep it somewhere secure. DON’T keep your password in a file on your computer’s hard drive. We recommend updating passwords at least yearly, but a quarterly or monthly password change is even better. If you have a hard time, there are myriad password generators that can help you out. And, to help you remember, make it part of another seasonal maintenance program. For example, you could use the start and end of Daylight Savings to tackle cleaning projects. The easiest way for hackers or nefarious software to access your WordPress site? Old admin accounts. Stick to the ones you absolutely need and use regularly and downgrade or delete the rest. Also, use this time to rename admin accounts. Just like you do on your computer occasionally, you should do a yearly or bi-annual cull of unused files on your WordPress site. But, before you jump in here, go back to step 1. Did you back up your site? If you didn’t, do it now. You can find files in two places. First, in your wp-content tab. Go through and delete any files you are currently using. Unused files take unnecessary bandwidth and can slow your site way down. Second, check your media library for videos, pictures, and audio files that are gathering virtual dust. If you aren’t using it, delete it. Comments are great. You want that engagement and should be approving comments, at least, weekly if you have the option to approve selected; daily is better. However, every 2-4 weeks you should check through your comments and get rid of any spam comments that came through. Spam happens to the best of us, and those comments are just taking up space on your site that could be better used elsewhere. It also just doesn’t look nice. Spam comments sitting there unchecked send a subtle message implying an uninvolved site owner. Don’t send that message. And, from a security point of view, some malicious comments are used to interject a worm hold to your site files. Cleaning out comments and then hardening your drive can help protect your site’s integrity over time. Ideally, visitors to your site will send a sternly worded email warning you a link is broken and you can fix it right then, but it pays to do an annual check of your links to ensure all of them are working and directing traffic where they should be. Now, the idea of going through a manually checking each link is exhausting. Honestly, we’re getting tired just thinking about it, but we live in the future and there’s an app for that! Broken Link Checker and other similar plugins can run a check on your site to make sure all links are working properly. This may seem superfluous after all the back-end work you’ve been doing, but it’s still important. Periodically, visit your site as you would if you were a visitor. Click through the navigation bar, read through the pages. Is it flowing the way you want? Is it still reflecting your brand and vision? Does it still include everything you need? Use this time to check for any organizational issues or anything that makes navigation confusing or less than intuitive. It may even be helpful to get a second set of eyes, maybe of a friend or family member, just to make sure everything is still looking good. Your Google Webmaster Tools account, (Now Google Search Console), should be registering any error messages about your site. Make sure to log in at least yearly to resolve any error messages, but it’s better if you can do this monthly or at least quarterly. Need Help Getting Your Site up to Speed? WordPress makes a good product, and it’s still one of the best platforms for building and maintaining your website, but even the best online engine needs maintenance once in a while. Monthly site maintenance like this can make all the difference in the functioning of your website. It improves your speed, keeps hackers out, and ensures that you’re delivering quality content to your clients every day. Just know you don’t have to go it alone. If the idea of site maintenance seems overwhelming, that’s ok. We’re here to help. For help with your WordPress site maintenance, take a look at our management packages here!